When water starts to leak through your basement walls or floors, it can quickly lead to a very serious flood in your home. Woodford Bros., Inc. understands how all different types of basement leaks are caused, which is why we provide a variety of repair products and techniques to handle every source of wall and floor leaks. To get a free estimate on basement leaking solutions and crack repair services, call us at 1-855-203-6835 or click below! 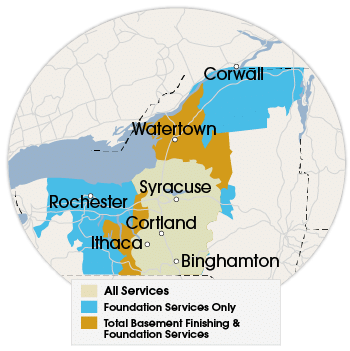 We offer basement crack repair and basement waterproofing in Utica, Binghamton, Rochester, Syracuse, Ithaca and throughout New York. Call the basement waterproofing experts at Woodford Bros., Inc. today to get started on your crack repair with a free estimate. We offer all our services in Rochester, Binghamton, Syracuse, Utica, Ithaca, Liverpool, Elmira, Rome, Canandaigua, Endicott, Auburn and throughout the surrounding areas.